Cute, but does it play the tune as you ascend the stairs? Given modern technology, that'd be pretty trivial to do. Interesting, but perhaps not adventurous enough. MOH drives a white high-roof T4 VW Camper which she had a custom paint job done on. On one side is a rainbow and on the other flank in a wave design is a treble musical stave with the first line of 'Somewhere---over the Rainbow.....' Music buff friends can read it, of course. Quite inexplicable to me, we attended a delightful matinee performance of Alice in Wonderland just before Christmas and MOH expressed pleasant surprise that Judy Garland's tune was performed throughout. How she had forgotten that the two are one and the same 'passeth all understanding', for me! as One climbs up the staircase the "tune"/melody is from the song "Somewhere Over The Rainbow" which have the words which say: "Someday I'll Wish upon a Star". One wouldn't want to trip and have A-Major fall and B-flat at the bottom. denimini wrote: One wouldn't want to trip and have A-Major fall and B-flat at the bottom. You now owe me a new keyboard as mine is now floating in coffee!! 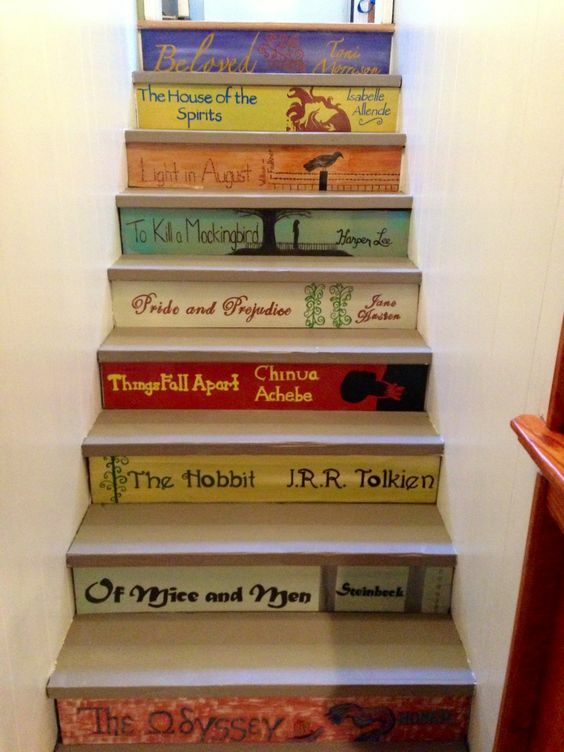 Lots of images on Pinterest of staircase risers with images on them. I've also seen book spines recreated on risers, which looks cool.